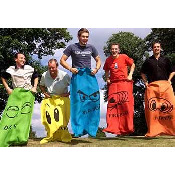 Relive school days racing in these specially designed adult sized Potato Sacks. Made from jute with double stitching for strength and durability. Can be folded down to fit any child. Each sack measures 114 x 76cm (45 x 30ins). Comes with a set of five.